You should know that filling the website with content is good for the company. Yet miracle does not happen because of the simple articles writing. Below you will find tips on how to attract readers. First, try to stay in mind to get more traffic to your blog or website. A rolling stone gathers no moss. So namely success consists in being active. The first step is to join groups that are thematically linked to the niche which you work in. You should also understand who is a member of your target audience in order to communicate in the circles where your customers do. Users usually take advantage of the Internet in search of entertainment or useful information. Participating in forums, answering users’ questions, engaging them in a debate, you will know what people are interested in. That will help you easily find a topic for the next post. Paying attention to someone else’s post, you automatically attract attention to yourself. Get involved in the debates, highlight the opinions of others. Thus, people will be more willing to visit your website or blog. Do this frequently and you will get noticed. Perseverance is important in all areas of your life. Once you have found a community that benefits your brand, it’s important to stay visible in them. Develop a plan of actions that will allow you to remain noticeable, such as leaving comments on users’ posts, sharing some relevant information and your own posts. People should see in you a source of information, then traffic driving will not take long. Try to become an expert and guru in most questions. Urgent information and good advice always help to increase trustworthiness to you. A good way to attract attention is undoubtedly the launch of your own Google+ Community, especially if you had already participated in this network. To increase brand recognition create a community and invite people from other social networks in which you are present, attract people from your company, and of course, fill the page with interesting and useful content. 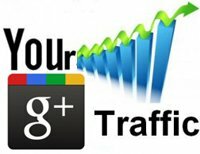 Now you should be aware of the benefits of Google+ Communities in traffic driving. However never be obsessed with the number of clicks. It is better to focus on improving the reputation of your brand.